Fight Back™ is a powerful immune system support product designed to maintain natural immune function. Fight Back™ utilises ingredients best known for their natural healing properties and benefits to aiding immune system function. For best results, feed Fight Back™ for a minimum of 7-10 days. Most will see results within days.You won't be disappointed with the results of Fight Back™ but if you're in doubt, please contact us - CLICK HERE. Fight Back™ is not designed to be fed alongside steroids/antihistamines. For full list of active ingredients and dosage rates please click here. 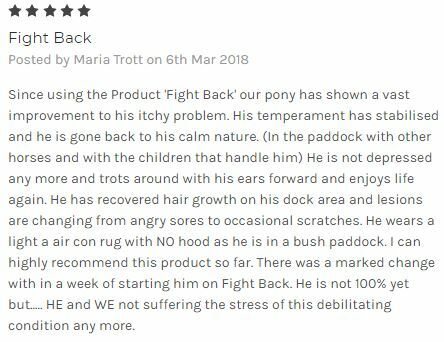 Since using the Product 'Fight Back' our pony has shown a vast improvement to his itchy problem. His temperament has stabilised and he is gone back to his calm nature. (In the paddock with other horses and with the children that handle him) He is not depressed any more and trots around with his ears forward and enjoys life again. He has recovered hair growth on his dock area and lesions are changing from angry sores to occasional scratches. He wears a light a air con rug with NO hood as he is in a bush paddock. I can highly recommend this product so far. There was a marked change with in a week of starting him on Fight Back. He is not 100% yet but..... HE and WE not suffering the stress of this debilitating condition any more.